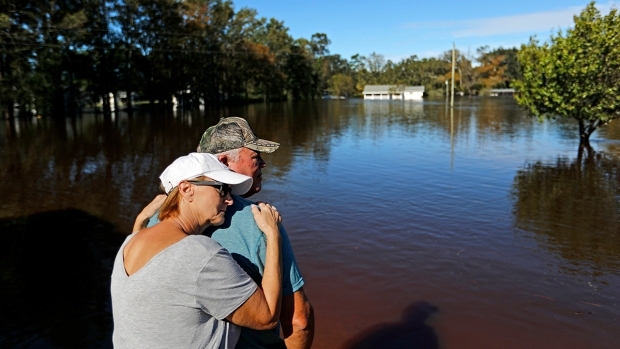 Flooded rivers from Florence's drenching rains have swamped coal ash dumps and low-lying hog farms, raising pollution concerns as the swollen waterways approach their crests Monday. The Associated Press published photos of a hog farm outside Trenton on Sunday with long metal buildings ringed by dark water. Satellite photos of the same farm taken before the storm show the location of a hog waste pit completely submerged under floodwaters in the AP photos. The N.C. Pork Council, an industry trade group, emphasized Monday that the hog waste pits flooded by Florence represented a comparatively small number when compared with the total number statewide. "While there are more than 3,000 active lagoons in the state that have been unaffected by the storm, we remain concerned about the potential impact of these record-shattering floods," the pork council's statement said. An AP analysis of location data from hog waste disposal permits shows at least 45 active North Carolina farms are located in 100-year and 500-year floodplains. 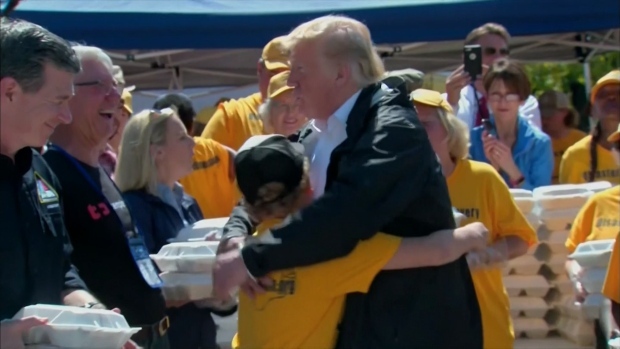 Federal forecasters predicted several rivers would crest at record or near-record levels by Monday, and high water could linger for days. Duke Energy said the weekend collapse of a coal ash landfill at the L.V. 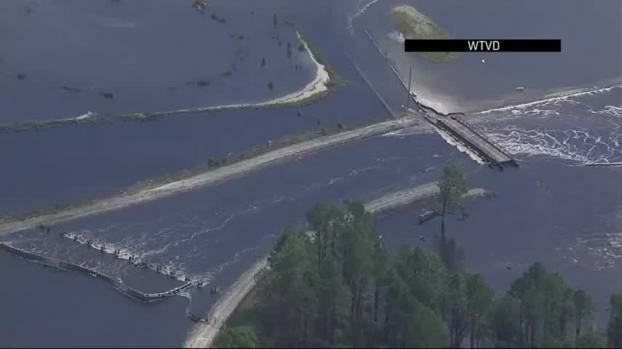 Sutton Power Station near Wilmington, North Carolina, is an "on-going situation," with an unknown amount of potentially contaminated storm water flowing into a nearby lake. At a different power plant near Goldsboro, three old coal ash dumps capped with soil were inundated by the Neuse River. At the closed Sutton plant, Duke spokeswoman Paige Sheehan said a full assessment of how much ash escaped from the water-slogged landfill can't occur until the rain stops. The company initially estimated Saturday that about 2,000 cubic yards (1,530 cubic meters) of ash were displaced, enough to fill about 180 dump trucks. Sheehan said the estimate could be revised later. The coal-fired Sutton plant was retired in 2013 and replaced with a new facility that burns natural gas. The company has been excavating millions of tons of leftover ash from old waste pits at the site and removing it to a new lined landfill constructed on the property. The gray ash left behind when coal is burned contains toxic heavy metals, including arsenic, lead and mercury. Photos from the site provided to AP by Cape Fear River Watch, an environmental advocacy group, show cascades of gray-colored water spilling from at least two breaches at the landfill and flowing toward Sutton Lake, the plant's former cooling pond which is now used for public recreation, including fishing and boating. Sutton Lake drains into the Cape Fear River. Sheehan said Duke's assessment is that there was minimal chance any contaminants from the spill had reached the river. Duke's handling of ash waste has faced intense scrutiny since a drainage pipe collapsed under a waste pit at an old plant in Eden in 2014, triggering a massive spill that coated 70 miles (110 kilometers) of the Dan River in gray sludge. The utility later agreed to plead guilty to nine Clean Water Act violations and pay $102 million in fines and restitution for illegally discharging pollution from ash dumps at five North Carolina power plants. It plans to close all its ash dumps by 2029. Environmentalists have warned for decades that Duke's coal ash ponds were vulnerable to severe storms, potentially threatening drinking water supplies and public safety. "Duke Energy should learn its lesson from this latest coal ash failure, and pledge today that it will remove all its coal ash from dangerous unlined riverfront pits," said Frank Holleman, a senior attorney at the Southern Environmental Law Center. "If Duke Energy's newly-designed and built landfill cannot withstand flood waters, there is even more reason to fear Duke Energy's continued disposal of coal ash in unlined riverfront pits." Data journalist Angeliki Kastanis contributed.